If you own a bike, then you should own a bike lock, that’s just a given. Theft in any situation is a very serious matter. Owning a bike lock means that the likelihood of you having your bike stolen is close to none. 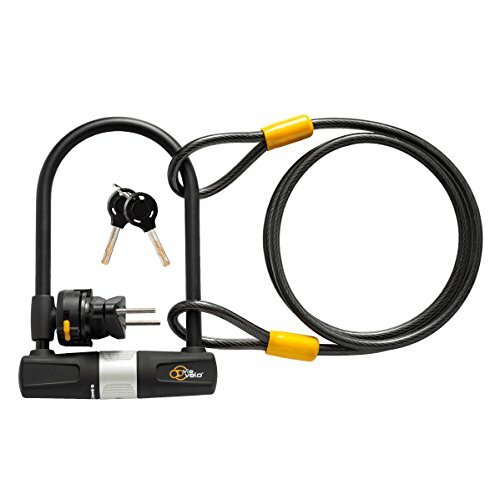 Bike locks will vary in terms of quality, some are known to be a lot sturdier than others for obvious reasons. What lock you choose will depend on various factors that one should consider. We’ve done all the hard work in this article so that you don’t have to. It’s said that one of the hardest decisions one can make when it comes to owning a bicycle is finding the right sort of lock that not only keeps your bike secure but doesn’t cause damage to it once it is attached. Finding the right lock can take time. Hopefully, this article will help speed up the process, or at least educate those in need of info! Finding any bike lock is easy, finding the best bike lock that works for you is another story with another set of questions. There are various bike locks out right now, all work just a little differently, some harder to use than others. Later in the article, we will be going over the various types of bike locks and what makes them tick, so if you do have any questions, we should be able to answer them. The first lock in our list here is one that requires a five digit combination to keep it secure. Combination locks are popular for a reason and have been for quite a while now. With five rotating dials, you’ll find that your lock has up to 100,000 possible codes, making it somewhat difficult to crack if anyone tries to break the code. Made with a durable cut resistant cable, this lock is made from 0.27-inch extra thick steel, it then has a cut resistant coating over the top that only adds to the strength of the lock outright! The cable is flexible as well as durable. 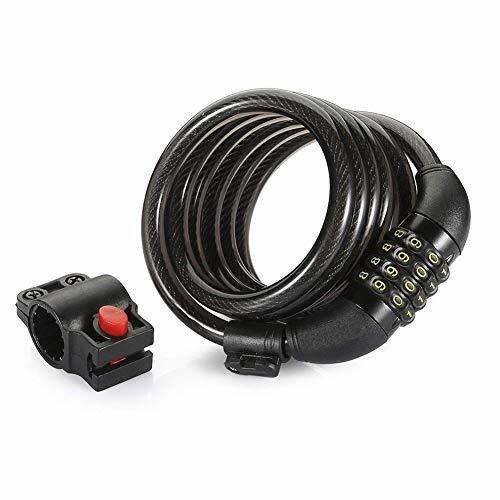 Why We Liked It – This Sportneer Bike Lock, 5-Digit Resettable Combination is a maximum security lock, one that is one tough nut to crack unless you have the right code! 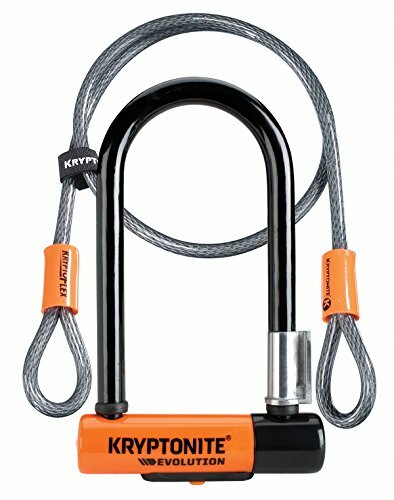 Company Kryptonite is one of the leading heads in the world of bike locks, which is partly the reason why we have included their mini 7 lock in our list here. This lock is smaller than some of the other locks mentioned in our list here, but boy does it pack all the punch of your bigger models! In terms of thickness, this lock boasts 13mm of hardened steel, the kind that will no doubt keep any bike bandits at bay. The double deadbolt design makes this lock as secure as possible once you’ve saddled your bike up outright! Why We Liked It – A much smaller lock that comes with all the benefits of those much heavier! If you have a somewhat small bike, then this will be the lock for you. Titanker’s bike lock cable is one of their finest to date. The easy to set, four-digit combination is one tough nut to crack! 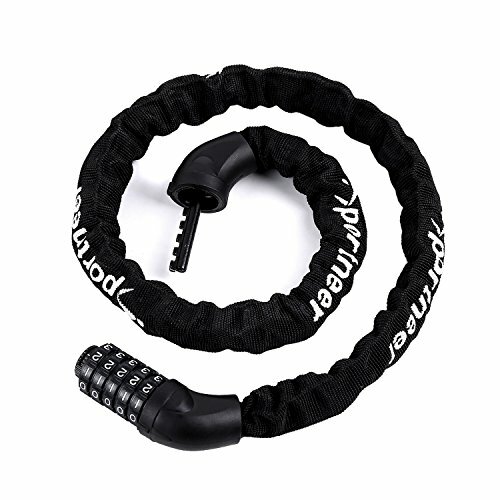 This bike lock is a self-coiling lock, meaning you can bend this lock in all sorts of different shapes and not have to worry that you’re wearing it down. This is yet another steel lock, one that comes with a strong PVC coating that only helps prevent scratching and strength. 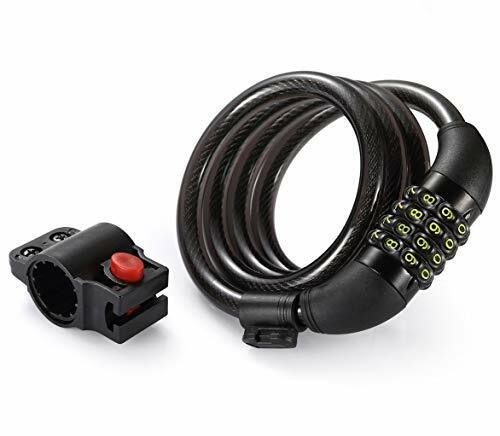 Many reviews for this product suggest that you don’t even have to use this lock for bikes alone, various customers have found this lock useful in keeping other items safe, such as tools or sporting equipment; one of the most versatile locks going right now! 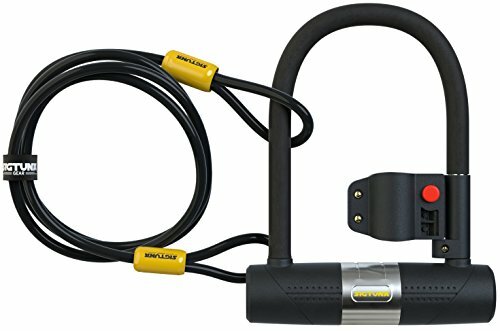 Why We Liked It – The multi-purpose use of this Titanker Bike Lock Cable, 4-Feet Bike lock makes it a clear standout compared to other locks out right now! A slightly smaller coil key lock, the kind that you can thread around your bike a few times before locking it with a key. This 8mm braided steel coiling cable is weather resistant which is definitely helpful if you are locking your bike outside. When you purchase this lock, you do get a spare set of keys which is definitely great to have too! If you find that you cycle around with your lock attached to your bike rather than in a cycling backpack of some kind, you’ll find that the light weight design of this lock doesn’t slow you down at all once you’re cycling. Why We Liked It – This lightweight lock is one that only gets better over time, a freakishly durable lightweight lock. At our halfway point we have a lock that is probably one of the strongest — and heaviest — in our list here. This lock comes made of 16mm high performing steel, the kind that comes outfitted with a double bolt locking mechanism that’s been designed for durable resistance should anyone try pulling it out of place. We weren’t joking when we said that this lock was durable — the coating found over the lock is one that will keep it not only secure but scratch-proof also. This is one of the best D locks going right now, check it out! Why We Liked It – If you were looking for something a little bulkier for maximum durability, this will then be the lock for you! A durable all-weather bike lock, that’s how we’d best go about describing the next lock in our list here. This lock from Via Velo is one of the most effective locks around, one that could go against any of the locks in our list here! This is a U lock, one that comes with a hexagonal PVC cover that actively resists corrosion from water and other elements. This lock is one that comes with two keys just in case you lose one. Not only is this lock quick and easy to use but it is incredibly durable and can withstand a lot of punishment if someone happens to try and break it! Why We Liked It – Consistency is key in bike locks, something that this Via Velo lock in particular has in spades. Some like to have a little bit of extra length to play with so that they can wrap their cable around their bike multiple times! Titanker returns with their six feet bike lock, one that comes with all the bells and whistles you’ve probably come to expect from these guys. Again this is yet another combination lock, one that is rather easy to use once you’ve settled on a combination! In terms of performance, this cable is one that can take a lot of punishment mostly due to the PVC coating that you’ll find spread over the top layer of the cable. Titanker has been included twice in this list for a reason, check out either of the two we’ve suggested if quality is what you’re looking for. Why We Liked It – If you are looking for a slightly longer bike lock that’s still just as durable as the rest, then this will be for you. In the market for something that combines the bulkiness of some of the bigger locks out there with the simplicity of a combination lock? 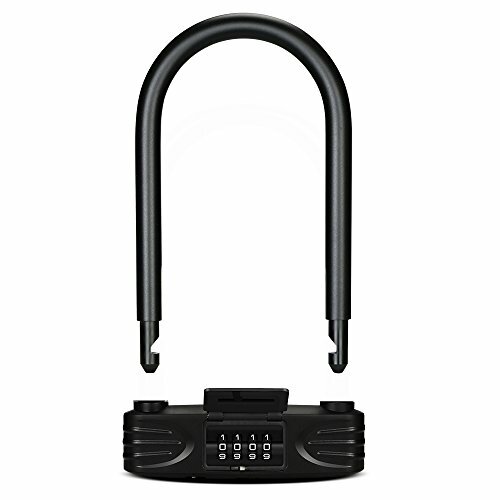 You’ll find that and more from Amazer’s heavy duty bike lock. This lock is made from 12mm hardened performance zinc, a material used in the shackle, as well as the bar — the bar, is coated in a PVC overlay to prevent scratching and increase durability simultaneously. Gone are the days of losing your keys (and backup keys if your lock had a spare) with this heavy duty lock! This lock is slightly heavier than most, but if anything this should provide more security for your lock outright in the process! Why We Liked It – This lock really is the best of both worlds, on the one hand, you have the benefits of a heavy lock and on the other, you have the simplicity of a combination attached! 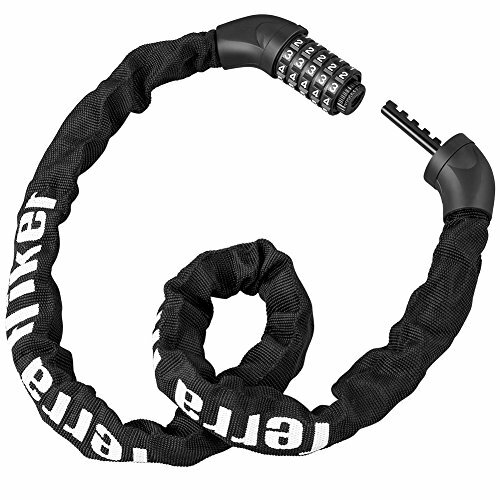 A bike lock made for the many hikers out there! This accurate five-digit combination lock is one that offers around 100,00 different possible combinations. Having this amount of combinations — as we’ve already mentioned on one of the previous locks — is beneficial in making sure that your lock goes untampered with! The strengthened zinc alloy lock is one that is covered with an ABS shell that won’t crack at low temperatures. The lock actually adopts a sealing plug system that keeps water and dust from entering the lock and breaking it outright! Why We Liked It – This might be one of our favorite locks out of this list! It ticks a lot of boxes and is hands down one of the most secure we’ve come across! If you are looking for the most secure lock going right now, it would have to be this one! Be warned, this lock is one of the heaviest locks around, one that is made from 14mm six-sided chain links that are next to impossible to break through. 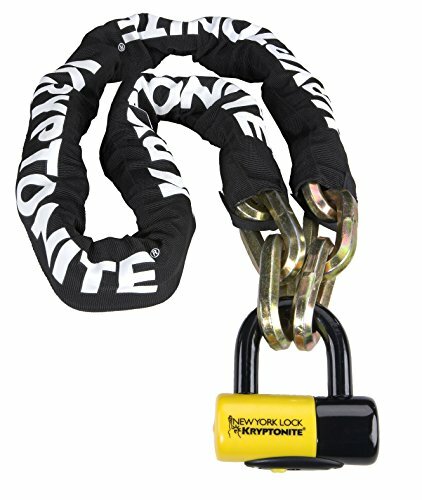 The protective nylon cover with hook and loop fasteners only add to the durability of this chain also. We would recommend you only use this lock sparingly. When you might use this lock will depend entirely on the situations you find yourself in during your basic routine. It’s easy to believe that this lock is overkill and that’s because it technically is, but if you’re riding around in an expensive bike and don’t want it stolen, then this is an option for you. If not you can always opt for a cheap bike! Why We Liked It – There are plenty of people out there who are never satisfied with the security of their bike lock, this isn’t one you need to worry about, it’s a monster! Welcome to the buyer’s guide, a section where we cover some of the questions you might have after scanning our list above. Most of you that have come to this article are more than likely those who have either just purchased a new bike or have had one stolen in the past and are looking for a lock that is as secure as possible. No matter your reason, we hope that you find/have found what you’re looking for and decide on the right bike lock that works for you! This project was incredibly fun for us — despite the simplicity of the products discussed. Bike locks are an essential part of owning a bike for many reasons, we shouldn’t have to explain why that is. We have had our bikes stolen in the past — at first we were frustrated, angry even, but then we realized that we mostly had ourselves to blame given the quality of our lock; a lock that wasn’t as sturdy as we initially expected. It’s very easy for someone to rush into purchasing the wrong sort of product without thinking it through. The lock we had originally was made from cheap plastic and could have been broken using your hands. We would often joke and state that losing our bike was the best thing that ever happened to us as it forced us out of our comfort zone and into the idea of the article you’re reading right now! We worked alongside a few of our closest friends on this article — all of whom own bikes of their own and have actually had bikes stolen in the past also. Having multiple eyes on this article at any given time definitely helped us rid any bias that could have taken over this article. Not only that, but having multiple people in the room at any given time allowed us to confirm our thoughts or bounce ideas off of one another to make sure our minds were in the right place! The goal here was to find some of the best bike locks around right now, something we believe we more than achieved given the diverse list of bike locks you see listed above. Our first step was to source some of the best bike locks around right now. We scoured the internet as well as catalogs to find some of the best bike locks around! This gave us a list of about 35 different bike locks. A lot of our selections were quite similar to one another in not only the manufacturer but the look/features of them also. The second stage of this process was to eliminate these duplicate locks and find those that were far more consistent/reliable. User reviews on Amazon were incredibly helpful in understanding what other customers had to say once they actually had these products within their possession. At this point, we had around 13 bike locks left to discuss. What happened next involved purchasing each bike lock and testing it out first hand to see how well it handled being used to chain an actual bike. Each lock worked just a little differently, some more surprising than others in terms of how durable it was. Each lock was chained to a bike and then marked on a grade out of ten. Not only that, but we tried to break the locks using a variety of different tools to see how each lock handled being tampered with. Bolt cutters, saws, and regular blunt instruments were used to try and wear down each bike lock. All locks were able to survive our tampering although some did end up scratching and sporting other noticeable damage. This was somewhat of a red flag for us, as over time scratches can dig deep and cause your bike lock to snap. Thanks to this process we were able to finalize our list! We tried to avoid changing our list as much as possible to keep the integrity of the list solid; something we believe we more than achieved! 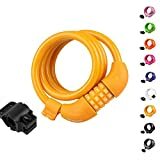 If you went through our list before reading this section, then you’ll know that there were various kinds of bike locks included, each as effective as the other in their own way. Riders should always choose a bike lock that fits them and their own personal preferences. Before you even think about purchasing a bike lock of your own, you should first outline your reasons for wanting to buy a bike lock. Cable locks are the sort of locks you should buy if you like wrapping your bike up securely. Cables tend to be a lot more flexible and lightweight compared to that of D locks and U locks. Most cables tend to come with combinations — although in some cases you’ll find some come with a key lock. In our experience, cable locks appear to be a lot easier to attach and detach with no waste in motion. The number of dials on your combination might differ depending on the bike lock cable you own. We tend to go for locks with a five digit combination for added security and peace of mind. In terms of security, cables tend to be rather difficult to cut through or pull loose due to the mechanisms found within the lock and the coating found over the top of the cable. Something a little sturdier that is next to impossible to break through. D locks, and U locks tend to be far more study than cable locks although they are a tad bulkier/heavier in comparison. 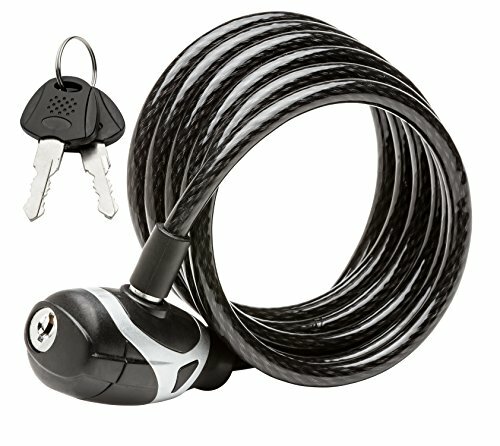 If you find that remembering a code is somewhat difficult, then owning a D lock/U lock is a lot easier to manage due to the keys you use to lock/unlock these bike locks outright! These locks require a couple more seconds to lock, but it’s definitely worth it if you are slightly worried about your bike being tampered with. Chain locks are a lot heavier in comparison to the other two types of locks that we’ve just mentioned. Chain locks offer the maximum amount of security possible out of any bike lock, the only downside comes in having to carry it around with you. Chain locks are next to impossible to snap/bend/break, which definitely provides peace of mind to anyone looking to keep their bike secure!